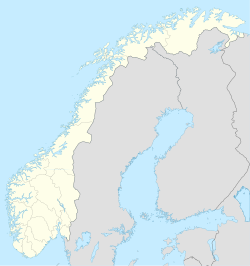 Jakobsnes is a village in Sør-Varanger Municipality in Finnmark county, Norway. Its population in 2005 was 271. The village lies on the coast of the Bøkfjorden, across the fjord from the town of Kirkenes, about 6 kilometres (3.7 mi) north of the village of Elvenes. ^ "Jakobsnes" (in Norwegian). yr.no. Retrieved 2013-03-15. ^ "Jakobsnes". Store norske leksikon (in Norwegian). Retrieved 2013-03-15. This Finnmark location article is a stub. You can help Wikipedia by expanding it. This page was last edited on 28 November 2018, at 13:52 (UTC).